I've been getting really excited about summer lately! Portland becomes so vibrant and alive in the summertime and my day planner is already starting to fill up with wonderful events and things to look forward to! I can't wait to go on some wonderful day trips and adventures with friends - this summer I hope to be able to go camping for the first time since I was a child, swim in the Sandy River, explore Tacoma (I hear there is a cute zoo & an amazing bridge of glass there), bungee jump, and just say yes to as many adventures as I can! There may even be a visit with a a baby sloth in my future!! Of course summer is also the perfect season for canning, gardening, and yard sales - 3 of my very favorite things. The kitchen is a hard place to be in the heat, but I plan on using the heck out of the grill & I breaking out that new ice cream maker that I picked up last year. 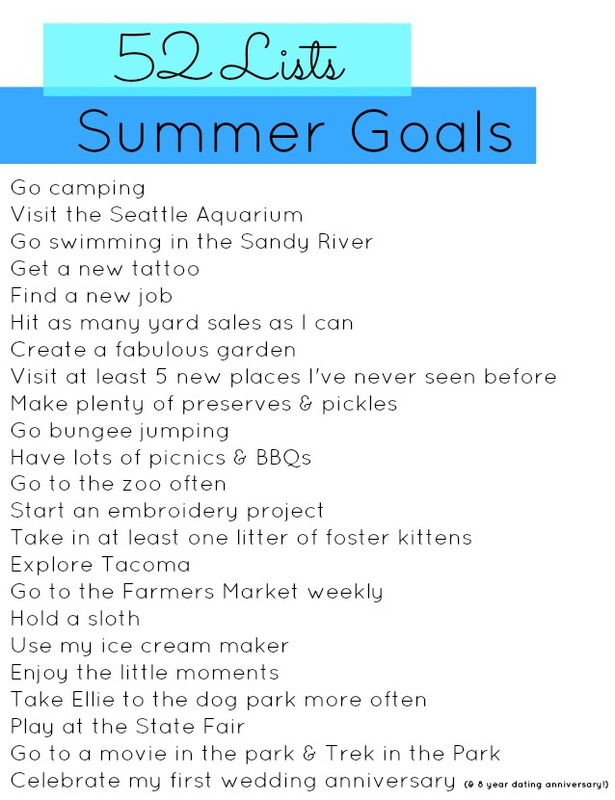 A lot of these goals of course correspond with my 30 before 30 list - 6 months to make it all happen! I think I am well on my way! This list totally has me amped for the next few months! What are you looking forward to this summer? Sounds like a great summer! Sounds pretty similar to my list! I live in Sandy, so I have swam in the river many many times. We will also be heading to the zoo a few times, and the state fair..
Portland is unreal during the summer, isn't it? It's crazy the contrast between the rainy season and summertime. Do you have any tips on where to go on the Sandy River? I've just heard that it's beautiful and I'd love to go check it out this year! That's a wonderful list I'm jealous! I'm curious to see what Summers in Portland is like. I may have to plan a trip! Hi Sarah! Thanks for linking up at B.You today! This list looks full of awesome adventures. I need to make one. Going to check out your 30 before 30 one now. I'm fast approaching 30, so I need to start jotting things down for that one too.